Pumpkin dishes served in the fall are usually sweet, made in the form of spiced breads or pies with dollops of cream. Though pumpkin desserts are delicious with their comforting richness and cinnamon scents, I enjoy trying my hand at incorporating this festive and well-loved squash into savory dishes. As warmer, heavier, and heartier meals begin to don the table as temperatures slowly drop, sometimes making a meal of a salad with a light dressing is a welcome departure from beloved pastas and roasted proteins. 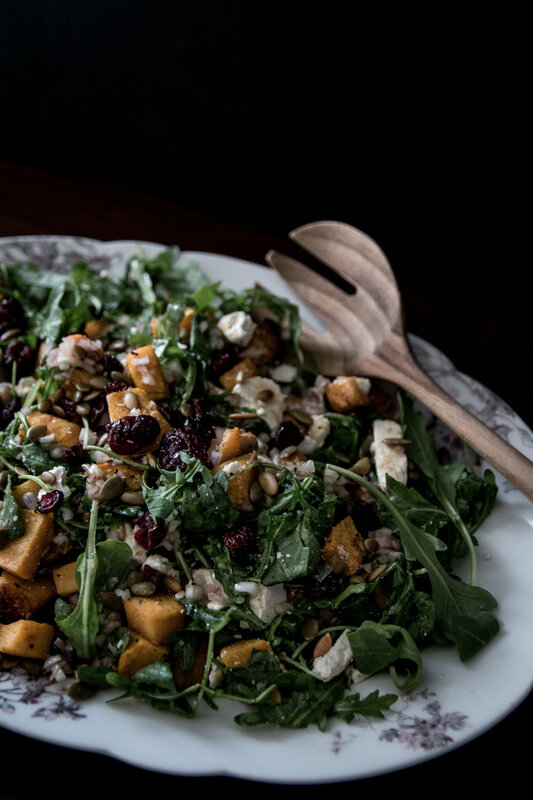 To celebrate the season and help it to be a bit more filling, roasted pumpkin is tossed with peppery arugula and tart dried cranberries. 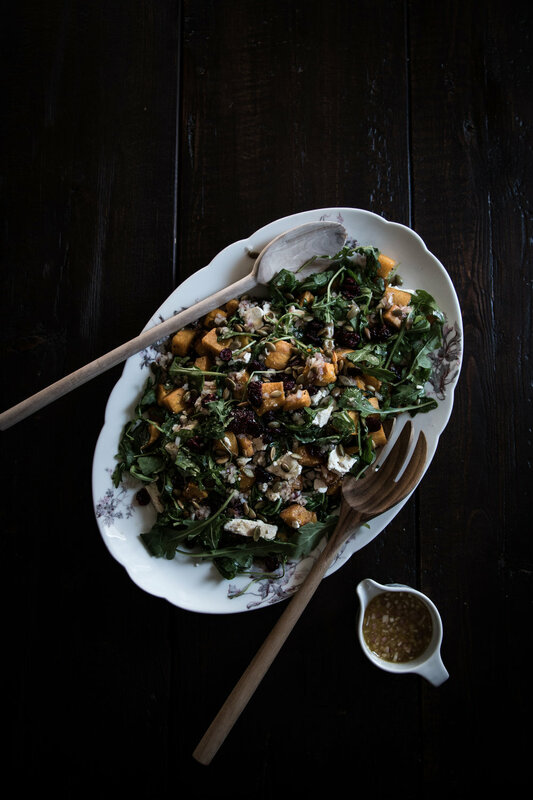 Creamy feta and crunchy pumpkin seeds bring texture and flavor to this salad, tossed with a sweet shallot dressing that compliments it all. 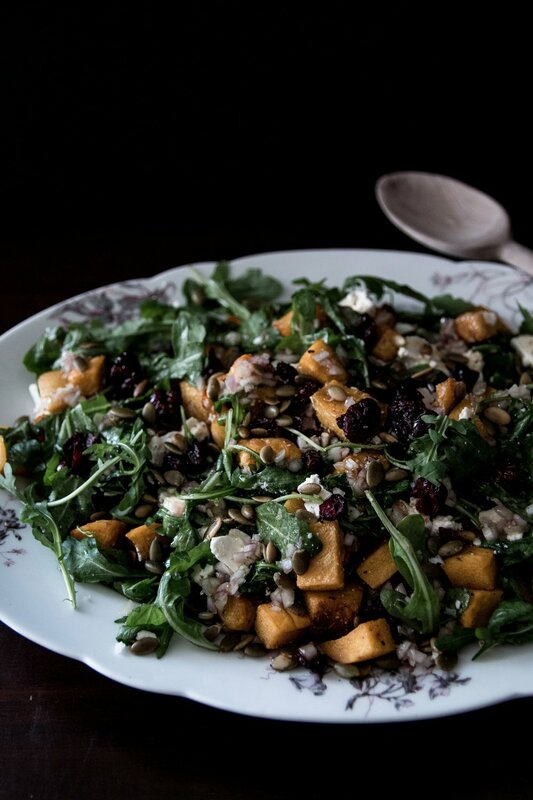 If you can’t seem to find sugar pumpkins, butternut squash will do nicely. Simply prepare it in the same manner listed in the recipe below. And if you have a bit of extra time on your hands, making a batch of honeyed chili and smoked paprika pumpkin seeds is a great way to use up those pumpkin seeds. Preheat oven to 400 degrees. Halve the sugar pumpkin, discard the seeds, and peel and discard the skin and stem. Dice the pumpkin into 1 to 1 1/2 inch cubes and toss with the olive oil, pumpkin pie spice, and a pinch of salt and pepper. Place on a baking sheet and roast in the hot oven for 25 to 30 minutes, until soft and slightly browned. Allow to cool completely before adding the pumpkin to the salad. To make the dressing, whisk the honey, mustard, and apple cider vinegar together. Slowly drizzle the olive oil in while whisking until the dressing is emulsified. Stir in the diced shallot and salt, to taste. With the amounts listed, you may have dressing left over, so add it to the salad to preference. 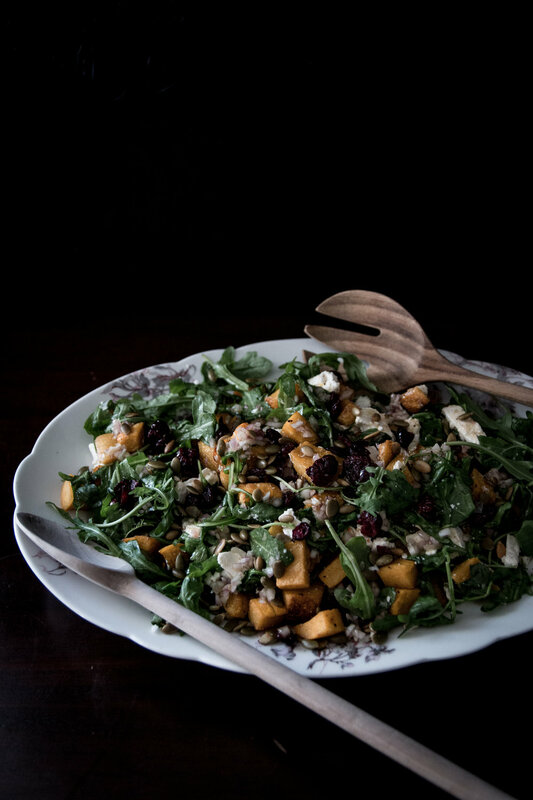 To assemble the salad, toss the cooled pumpkin, arugula, dried cranberries, feta, and pumpkin seeds with the dressing to taste. Serve immediately.